117 Hudson: Puppy! Puppy! Puppy! I didn't get as many quality shots of ChemE's pooch as I would have liked. I missed some important opportunities in the hustle and bustle. 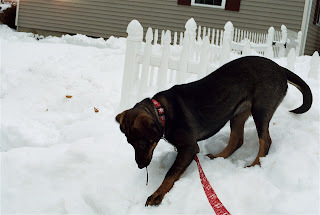 Here she is atop a 4 foot snow bank trying to dig out the one twig she could find.